I had the pleasure of conducting an email interview with Dr. David Sailor, the director of the Green Building Research Laboratory (GBRL) at Portland State University (link to resume). He is a leading researcher in the effects of green roofs and energy use in buildings and the impact green infrastructure can have on cooling our cities. He and his colleagues have developed tools to help quantify these impacts. Green Infrastructure Digest (GrID): I understand that this year you became the first Director of the Green Building Research Laboratory (GBRL) at Portland State University. What is the focus of the research you are conducting at GBRL? Why and how was GBRL started? Dr. David Sailor: The Green Building Research Laboratory was essentially an outgrowth of the funded research agendas of myself and my GBRL colleagues. This group of Portland State University faculty included Graig Spolek in Mechanical and Materials Engineering, Loren Lutzenhiser r in Urban Studies, and Sergio Palleroni in Architecture. Over the years we had developed a number of collaborative projects and decided it was time to build upon this collaboration by creating a physical laboratory where we, our students, and our industry partners could work together on fundamental and applied research to benefit the green building industry. We pitched the idea of a collaborative shared-user facility to Oregon BEST and to the PSU Center for Sustainable Processes and Practices, both of whom agreed to provide the initial funding for the lab. As a result, while the lab was initiated by four faculty members at Portland State, it really serves as an Oregon University System shared resource. There really is a wide range of research activities going on in the lab. This includes several monitoring projects with local builders, property owners, and school districts with a focus on understanding the thermal and moisture performance of building envelopes as well as the indoor environmental quality of these buildings. 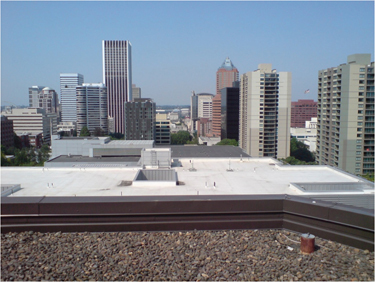 We also continue to make advances in the monitoring and modeling of green roof performance. Personally I have been involved in a number of monitoring projects and in creating an energy modeling tool for evaluating the energy performance of green roof design decisions. My colleague Graig Spolek has been using some of the GBRL water quality testing equipment to better understand the chemical composition of green roof runoff. We are also using GBRL facilities to understand the interactions between buildings and the urban atmospheric environment. This involves both modeling and field measurements. GrID: A lot of your research has been focused on green roofs and heat island mitigation through the use of green infrastructure. How significant of a role does green infrastructure have in addressing thermal heat gain within our built environment? It appears through the tools you have developed for the MIST program that you have been able to quantify these impacts? Can you explain to our readers, what the MIST program entails? Dr. Sailor: Yes, my research career actually started with a focus on urban heat island mitigation through use of urban vegetation and highly reflective (high albedo) urban surfaces. The US EPA funded some of my early modeling efforts in an attempt to provide a quantitative assessment of how much potential there is for cities to cool their summertime air temperatures through city-wide modification of urban surface characteristics (vegetation and albedo). We used regional scale atmospheric models of about 20 cities across the US to create information on the potential impacts of such mitigation on summertime urban air temperatures, peak ozone concentrations, and energy consumption. The result of that was a fairly user-friendly urban heat island screening tool – the Mitigation Impact Screening Tool – or MIST. The tool uses fairly simple interpolation and extrapolation of our modeled results so that policy makers in any US city can easily estimate the order of magnitude of the impact that any particular mitigation strategy might have in their city. I like to emphasize the “S” in MIST – this is a Screening tool. Ultimately, any policy decisions that involve significant investment of public funds to mitigate the urban heat island ought to be based on a more thorough, city-specific analysis – which of course can start by running MIST. GrID: Many of our readers would like to know if green roofs can reduce energy use in buildings and if so, by how much? What factors most influence the outcome? What light has your research been able to shed on this pressing question? Dr. Sailor: The thermal performance of green roofs depends on a number of factors. 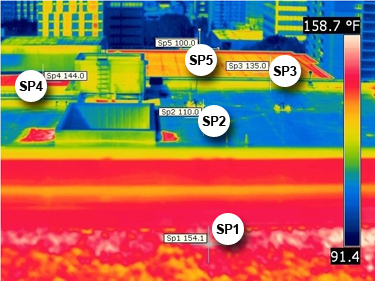 Specifically, roof construction, depth and properties of the growing media – including soil moisture, plant characteristics and coverage, and local climate characteristics all affect heat transfer into the building. The role of the roof on building energy consumption also depends on internal building loads and schedules. An often overlooked point is that the performance of any alternative technology depends on the baseline that is used for the comparison. As a result, I hesitate to assign a specific level of savings that could be expected from green roof implementation. That said, the various simulations that we have conducted for cities across the US have shown that a green roof can have comparable summertime air conditioning benefits to those achieved by white or “cool” roofs. In contrast to a cool roof, however, the added thermal insulation of a green roof can result in a wintertime heating energy savings whereas the cool roof generally has a wintertime heating penalty. In general, our model shows that the annual air conditioning energy savings associated with replacing a typical roof with a green roof are on the order of 100 to 500 kWh for each 1,000 sq. ft of green roof. What is important to note, however, is that the energy savings are just one component to be considered in determining the economic and environmental value of green roofs. It is likely that the stormwater, urban heat island, and extended roof life aspects of green roofs are equally important. GrID: The energy savings for green roofs are more modest than I would have expected. I remember some of your findings displayed at the 2007 Green Roof for Healthy Cities conference in Minneapolis had energy saving ranges between 4-12% depending on the location. Dr. Sailor: Yes, the air conditioning energy savings by themselves are modest. The numbers I gave above are just for the Air Conditioning savings. Heating savings can be comparable or more important depending upon the location and roof design. The data that you recall from the Minneapolis meeting were specified in terms of HVAC savings. The numbers from that poster were 3-6% annual cooling electricity savings in Minneapolis, 2-5% for Phoenix, and 3% in Orlando. For heating energy savings we had found up to 10-14% for Orlando and Phoenix, and about 4% for Minneapolis. While the model has changed some, these values are generally consistent with what we are still finding. The nominal ranges that I described from our current model simulations are for a green roof in comparison to a roof that has an albedo of 30%. Both roofs are assumed to be insulated to modern energy code standards. The actual savings depend very much on the baseline used for comparison with the current tool providing a conservative estimate that might significantly underestimate savings for some applications. Also, it should be noted, that depending upon soil depth, vegetative lushness, local climate, and building type, a green roof can actually INCREASE the energy cost for heating or cooling in a building. The tool can provide the necessary feedback to avoid such a situation, and then help you move toward an optimum design with respect to total energy performance. GrID: Oftentimes, engineers modeling the energy use of a building find it difficult to accurately simulate the effects of green roofs on energy use. Can you tell our readers about the plug-in your have created for the Department of Energy’s (DOE) EnergyPlus modeling software? How has this enabled mechanical engineers to more accurately model the effects of green roofs? How widely used is it? Dr. Sailor: We developed a physically-based model of the energy balance of a vegetated roof and integrated this model into EnergyPlus. This module is now a part of the standard release of EnergyPlus and allows the energy modeler to explore how variations in green roof design can impact whole building energy performance. It is hard for me to assess how widely used it is among practitioners in the field, but I have been contacted by multiple groups around the US who are now gearing up to use the model in their research and design work. GrID: If the impact green roofs have on energy use in a building is as modest as you describe, why would you need to model the green roof? Are there cases where it can/has make/made a significant difference? Dr. Sailor: As I mentioned previously, if one does not pay attention to the green roof design from an energy standpoint, the roof may perform WORSE than a conventional roof. The tool can help the user avoid such potentially undesirable outcomes and then be used to optimize the design for improving energy performance beyond a conventional design. In the case of a retrofit the existing roof insulation may be significantly lower than current code or the current membrane may be much darker than the 30% reflective baseline that I use in the modeling. In such cases, the actual energy savings of the retrofit may be much larger than that reported directly in the current version of the calculator. Nevertheless, the calculator can be used to optimize the energy performance of the new roof. Dr. Sailor: I think that historically there has been a bit of inertia within the building industry that tends to limit the pace of innovation and application of new concepts. From the perspective of an academic researcher I see great opportunities for applied research to develop new technologies and the data and modeling tools necessary to understand the building performance implications of these technologies. Green roofs and walls are technologies that are both promising, and receiving increased interest in recent years. In order for green infrastructure to reach its full potential, however, it is important to develop the tools and data needed to fully evaluate their many co-benefits.